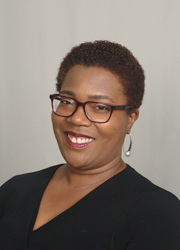 Dr. Natalie T. J. Tindall is department chair and associate professor in the Department of Communication and Media at Lamar University. Her research focuses on diversity in organizations, specifically the public relations function, and the situational theory of publics and intersectionality. She has authored book chapters and online publications along with peer-reviewed journal articles published in Journal of Public Relations Research, Public Relations Review, Public Relations Journal, Howard Journal of Communications, PRism, and the International Journal of Strategic Communication. She has served as the chair of the Public Relations Society of America Diversity Committee, a member of the Public Relations Society of America Work, Life & Gender Task Force, and the 2013-2014 Head of the Public Relations Division of the Association for Education in Journalism and Mass Communication. She was elected to the AEJMC Standing Committee for Teaching and continues to serve on the PRSA Diversity Committee, PRSA Work, Life & Gender Task Force, the Delta Research Education Foundation‘s Sister Scholars Advisory Board, and the national executive board of Delta Sigma Theta Sorority, Inc.
Dr. Tindall is also the owner of Rock Paper Scissors Consulting and runs The Tenured Entrepreneur blog.